Not to be confused with Kisumu County. Kisumu, officially known as Kisumu City (and formerly Port Florence), is the Kenyan inland port city on Lake Victoria and the capital city of Kisumu County, Kenya. At an elevation of 1,131 m (3,711 ft), the city has an estimated population of 500,000, while the metropolitan region comprising the city and its suburbs and satellite towns of Maseno, Kondele and Ahero was estimated at over 1.5 million as of 2017. It is the third largest city in Kenya after the capital, Nairobi, and the coastal city of Mombasa. Kisumu is the principal city of western Kenya, the immediate former capital of Nyanza Province, the headquarters of Kisumu County and the proposed headquarters of the Lake Region Economic Block, which is a conglomeration of 15 counties in Western Kenya. It is the largest and most important city in the Western Kenya. Kisumu International Airport serves the city with regular flights to Nairobi and other neighboring cities such as, Mwanza, and Kigali. Kisumu port was founded in 1901 as the main inland terminal of the Uganda Railway named "Port Florence". Although trade stagnated in the 1980s and 1990s, it is again growing around oil exports. Kisumu literally means a place of barter trade "sumo". The city has "Friendship" status with Cheltenham, United Kingdom and "sister city" status with Roanoke, Virginia and Boulder, Colorado, United States. When the Europeans first settled in the area in the late 19th century, Kisumu became a trading post – attracting the Luo people from as far as Migori and Siaya County. The Kisumu region was then occupied by the Luo community. A person going to Kisumu at that time would say, "Adhi Kisuma" to mean I'm going to trade. Derived from the word "Kisuma", the word for a trading post in Luo is "Kisumo". In Nandi "Kesumett". The current name Kisumu is an English corruption of the word "Kisumo" or "Kesumett". An opposing theory states that Kisumu acquired its name from 'Kusuma', the Maragoli word for 'trading'. Because, before the Luo arrived in the area, the Maragoli were already trading with other people in the area like the Nandi and Maasai. Some Luo words were acquired from the Maragoli. The Luo called it "Kisumo" meaning "a place to look for food" such that the Luo would say "I am going Kisuma" to mean "I am going to look for food". The Abaluhya called it "Abhasuma" which means "a place to borrow food" such that the luhya would say "I am going Khusuma" to mean "I am going to borrow food". The Abagusii called it "egesumu" meaning "a structure for keeping/rearing chicken". It is believed the Abagusii were in Kisumu but found Kisumu was not good for crop husbandry and agriculture. The Nandi called it "Kisumett" which means a place where food was found during times of scarcity and exchange, which cannot be attacked by Nandi and Terik irrespective of any issue. Kisumu was identified by the British explorers in early 1898 as an alternative railway terminus and port for the Uganda railway, then under construction. It was to replace Port Victoria, then an important centre on the caravan trade route, near the delta of Nzoia River. Kisumu was ideally located on the shores of Lake Victoria at the cusp of the Winam Gulf, at the end of the caravan trail from Pemba, Mombasa, Malindi and had the potential for connection to the whole of the Lake region by steamers. In July 1899, the first skeleton plan for Kisumu was prepared. This included landing places and wharves along the northern lake shore, near the present-day Airport Road. Demarcations for Government buildings and retail shops were also included in the plan. Another plan was later prepared in May 1900, when plots were allocated to a few European firms as well as to Indian traders who had travelled to Kisumu on contracts to build the Uganda Railway and had decided to settle at the expanding terminus. A later plan included a flying boat jetty (now used by the Fisheries Department). In October 1900, the 62-ton ship SS William Mackinnon was reassembled and registered in Kisumu, and made its maiden voyage to Entebbe, marking the beginning of the Lake Marine Services. The SS Winifred (1901) and the SS Sybil (1901) were later added to the fleet in 1902 and 1904, respectively. On Friday, 20 December 1901, the railway line reached the Kisumu pier, with the centre adopting a new name, Port Florence. By February, the railway line had been opened for goods and passenger transportation. Kisumu was also privileged to host the first flight in Kenya; the current police workshop was the first hangar in Kenya. Before the jet airline era, the city was a landing point on the British flying boat passenger and mail route from Southampton to Cape Town. Kisumu also linked Port Bell to Nairobi. In the meantime, it was realised that the site originally chosen for the township north of the Nyanza Gulf was unsuitable for the town's expansion, due to its flat topography and poor soils. An alternative site was therefore identified and the town's location moved to the ridge on the southern shore of the Gulf, where the town sits today. Consequently, another plan was prepared in 1902, which provided the basic layout of the new town on the southern ridge. This was followed by the construction of a number of Government buildings, notably the former Provincial Commissioner's Office (now State Lodge) and the Old Prison (now earmarked for the construction of an Anglican Cathedral). In 1903, the township boundaries were gazetted and some 12,000 acres, including water, set aside for its development. The new township reverted to its original name, Kisumu, in substitution of Port Florence. At this time, there was an 'Old Kisumu', that consisted of two rows of Stalls (Dukas) on Mumias Road, north of the Gulf. It was later demolished in the twenties when new plots became available on Odera and Ogada Streets in the present day Kisumu, hence the new area acquired the name 'New Bazaar'. Winston Churchill visited Kisumu in 1907. By the 1930s and 40s, the city had become a leading Kenyan centre for Commerce, Administrative and Military installations. In the 1960s the population of Asians in relation to locals was significantly higher. The town was elevated to the status of a Municipal Board in 1940 and later to a Municipal Council in 1960. In the early sixties, very little development took place in Kisumu, with an acute shortage realised in dwelling houses, shops and offices. The situation was later made worse by the influx of locals into the town following the declaration of independence in 1963. The city's growth and prosperity slowed down temporarily in 1977, as a result of the collapse of the East African Community. However, the city spurred with the reformation of the community in 1996 and with its designation as a "city." The port has been stimulated by the transformation of international business and trade, as well as the shipments of goods destined for Uganda, Tanzania, Burundi, Rwanda and Democratic Republic of Congo. Currently, Kisumu is one of the fastest growing cities in Kenya. It is thriving with rich sugar and rice irrigation industries, whose contribution to the National economy is immense due to its natural resources and as the epicentre for business in Kenya. Kisumu features a tropical rainforest climate with no true dry season and significant rainfall year-round. January is the driest month while the month of April receives the most rainfall. The average temperature is 22.9 degrees Celsius. Kisumu has highly fertile land and variations in temperature and rainfall with two rainy seasons per year across the region provides a suitable environment for a broad range of agricultural crops. The Kisumu region has approximately 1.6 million hectares of agricultural land. However, it is estimated that only 58 percent of the land is currently used. The majority of farming in the lake basin region is subsistence driven leading to relatively low production volumes. Current crop yields are considered to be significantly lower than the potential afforded by soil and climate conditions. Current low land utilisation and yields are driven by the lack of guaranteed markets and associated support services. Like agriculture, livestock farming is currently performed primarily on a subsistence basis. Cattle are predominantly indigenous breeds with lower milk output than grade cattle. The Kenyan part of Lake Victoria covers approximately 0.4 million hectares (4,100 square kilometres), with 550 km of lake shoreline; most of this shoreline is under-used. Attractions in the city include Kibuye Market, Oile Market, the Kisumu Museum, an impala sanctuary, a bird sanctuary, Hippo Point,Shopping malls and the nearby Kit Mikaye and Ndere Island National Park. On the main street of Kisumu city, Oginga Odinga Road, a tall Town Clock stands in the middle of the road. It was unveiled on 19 August 1938 by the then Governor of Kenya Sir Robert Brooke-Popham. The Town Clock was built in memory of Kassim Lakha who arrived in East Africa in 1871 and died in Kampala in 1910. It was erected by his sons Mohamed, Alibhai, Hassan and Rahimtulla Kassim, as the inscription on the Town Clock reads. Kisumu Museum, established in 1980, has a series of outdoor pavilions laid out in a formation similar to that of a Luo homestead. Some of the pavilions contain live animals. For example, one pavilion contains numerous aquaria with a wide variety of fish from Lake Victoria, along with explanatory posters. Another pavilion contains terrarium containing mambas, spitting cobras, puff adders and other venomous Kenyan snakes. Additionally, out of doors, the museum has a few additional exhibits, including a snake pit and a crocodile container. Other pavilions show weaponry, jewellery, farm tools and other artefacts made by the various peoples of the Nyanza Province. Additionally, there are exhibits of stuffed animals, birds and fish. One pavilion houses the prehistoric TARA rock art, which was removed for its own protection to the museum after it was defaced by graffiti in its original location. The museum's most important and largest exhibition is the UNESCO-sponsored Ber-gi-dala. This is a full-scale recreation of a traditional Luo homestead. Ber-gi-dala consists of the home, granaries and livestock corrals of an imaginary Luo man as well as the homes of each of his three wives, and his eldest son. Through signs and taped programs in both Luo and English, the exhibition also explains the origins of the Luo people, their migration to western Kenya, traditional healing plants, and the process of establishing a new home. Dunga Beach and Wetland is known for its unique eco-cultural attractions due to its biodiversity and cultural rich and diverse papyrus wetland ecosystem and local community respectively. Ecofinder Kenya has established Dunga Wetland Pedagogical Centre at Dunga Beach is a grass-root led intervention whose overarching cardinal goal is empowerment of Dunga Wetland Community and improvement of livelihood security of its people. Therefore, some of the main focuses in the centre are promoting Eco-Cultural Tourism and facilitate the conservation of the Dunga Papyrus Wetland Ecosystem. Kisumu is the location of the Kisumu Impala Sanctuary. During the British rule, Impala Park now sanctuary was called Connaught Parade. Measuring just 1 square kilometre (0.39 sq mi), the sanctuary is one of Kenya's smallest wildlife preserves. As its name suggests, it is home to a herd of impala. Some hippos, as well as many reptiles and birds are also present. Additionally, several caged baboons and leopards who faced difficulties of one sort or the other in the wild are held in cages there. Over 115 different species of birds live there. Hippo Point is a 240 ha (590 acres) viewing area on Lake Victoria. Despite its name, it is better known as a viewing point for its unobstructed sunsets over the lake than for its occasional hippos. Hippo point is located near the village of Dunga, a few kilometres South West of the city. The village also has a fishing port and a camping site. Kit Mikayi, a large rock with three rocks on top, and is located off Kisumu Bondo Road towards Bondo. Kit-mikayi means "Stones of the first wife" or "First Wife Rocks" in Dholuo, the Luo language. It is a weeping rock; it is believed that Mikayi (literally, "the first wife") went up the hill to the stones when her husband took a second wife, and has been weeping ever since.It has become a popular local pilgrimage site for adherents of the Legio Maria sect who come to the rock to pray and fast for several weeks at a time. Ndere Island, is a small island (4.2 km2 or 1.6 sq mi) in Winam Gulf of Lake Victoria in Kenya. It was gazetted as the Ndere Island National Reserve in November 1986 and has since that time been uninhabited. Great sweeping views into the Lake, with further serene and tranquil environment compared to the mainland. The Moi stadium is the main stadium of the city and plays home to various teams such as kisumu all stars and kisumu telkom FC. Peter Anyang' Nyong'o, the governor and father of Hollywood star Lupita Nyong'o, announced that the county will build a brand new stadium. At the same time the country's current government has plans to build a national stadium. As of 2018, the plans to build the stadium by either the governor and the central government has materialized. The condition of the current stadium is pathetic and not worthy of a city. Kisumu is represented in the nationwide rugby league by Kisumu RFC. The city is also host to a leg of the national rugby sevens circuit, being one of only six city hosts. The Kisumu leg is referred to as the Dala sevens and the annual tournament is extremely popular attracting thousands of fans from across the country. Before the jet airline era, Kisumu was a landing point on the British flying boat passenger and mail route from Southampton to Cape Town. Kisumu linked Port Bell and Nairobi. Kisumu is served by Kisumu Airport which has international status, with regular daily flights to Nairobi and Mombasa. Expansion of the airport cargo facility after completion of the passenger terminals is currently going on in anticipation of increased trade brought about by the recreated East African Community of Kenya, Tanzania and Uganda. Kisumu Harbour. The green vegetation is water hyacinth. Lake Victoria ferries have operated from the port linking the railway to Mwanza and Bukoba in Tanzania, and to Entebbe, Port Bell, and Jinja in Uganda.The first steam ships built in Kisumu in 1905 were the SS Sybila and the SS Nyanza. During World War II, three aircraft operated by South African Air Force crashed into Lake Victoria soon after take-off from Kisumu Airport. The first, a Lockheed Lodestar aircraft number "K"-248 (ex ZS-ATK) carrying a senior South African military officer, Major General Dan Pienaar, crashed on 19 December 1942, killing all 12 persons on board. The other two crashes involved Douglas C-47 planes; the first on 11 May 1945 (one fatality) and the second exactly three months later, on 11 July 1945 (28 fatalities). The bodies from the two earlier accidents were repatriated to South Africa, those from the third accident are buried in the Kisumu war-graves cemetery. The cause of the accidents is currently thought to be the katabatic wind condition which often affects Kisumu in the early morning. Two serious railway accidents occurred near Kisumu in the 2000s. The first took place outside Kisumu on 15 August 2000. The brakes on the train failed, causing it to roll. Thirteen people were killed and 37 received injuries. The second took place on the morning of 16 October 2005, when a matatu (taxi minibus) was struck by a passenger train. Six people died and 23 more were injured. After that there have been accidents in its major towns with notable black spots:[clarification needed] Ojola/Kisian, Kisat bridge, Ahero, Sondu, Awasi just but to mention a few. St.Therese of Lisiuex Cathedral of the Roman Catholic Archdiocese of Kisumu, opposite Kibuye Market. Christianity was brought first in the end of 19th c. by Anglicans. They are still, together with Legio Maria, predominant in the city. Kisumu is also a see of the Catholic Archdiocese of Kisumu, with her newly appointed archbishop Philip Arnold Subira Anyolo, who in November 2018 succeeded to archbishop emeritus Zacchaeus Okoth. The population is largely Luo people. In 2016 in the total of 2,684,974 inhabitants there were 1,498,037 baptized Catholics i.e. 55.8% of the population. 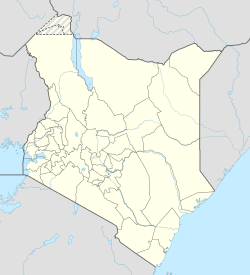 In the Siaya County over 70% of the population are Catholics. Robert Ouko, politician and son of Kisumu Nyahera who was abducted from his Koru, Kenya home. His charred body was found later. Nicholas Otieno, Pan Africanist, businessman, politician, philanthropist, artist and son of Joseph Otieno Mundhe, credited for a major role in the economic and cultural revolution that has brought tremendous wealth and stability to East-Central Africa. Lupita Nyong'o, Oscar award-winning Hollywood actress whose father is the current (2018) governor of Kisumu County. Kisumu City is now the new headquarters of the newly created Kisumu County in the new Counties of Kenya. ^ "Archived copy". Archived from the original on 29 July 2016. Retrieved 28 July 2016. CS1 maint: Archived copy as title (link) 2009 Census Vol 1 Table 3 Rural and Urban Population Retrieved on 22 January 2014. ^ "Kisumu City". www.africa-expert.com. Retrieved 19 September 2018. ^ "Kenya's fuel flow chain – how does it get to petrol stations?". Energy Siren. 15 October 2018. Retrieved 16 March 2019. The government recently built the Kisumu Oil Jetty on the shores of Lake Victoria that is used by ships for re-exports to landlocked Uganda, Rwanda, DRC and South Sudan. ^ a b Sven Boermeester (2009). "The Best of Kenya". Issuu.com. Retrieved 10 December 2013. ^ a b Anyumba, Godfrey (1890–1990). Kisumu town: History of the built form, planning and environment ( Housing and Urban Policy Studies). Netherlands: Delft University Press. pp. 61–70. ISBN 90-407-1067-8. ^ "Winston Churchill's 1907 African Travels". Kabiza.com. 2 September 2012. Retrieved 10 December 2013. ^ "World Weather Information Service – Kisumu". World Meteorological Organization. Retrieved 31 August 2016. ^ "Dunga Wetland Pedagogical Centre". ecofinderkenya.org. ^ "Kibaki launches Sh6.8bn Kisumu road projects – News". nation.co.ke. Retrieved 10 December 2013. ^ "ASN Aircraft accident Douglas C-47A-1-DK 6812 Kisumu". Aviation-safety.net. 11 July 1945. Retrieved 10 December 2013. ^ Neriba, Arnold. "The See of Kisumu: 40 Years of Evangelizing the Lake Region". The Seed. 30 (2018): 8–10. Retrieved 24 December 2018. ^ "Archdiocese of Kisumu". catholic-hierarchy.org. Retrieved 24 December 2018. Wikivoyage has a travel guide for Kisumu.